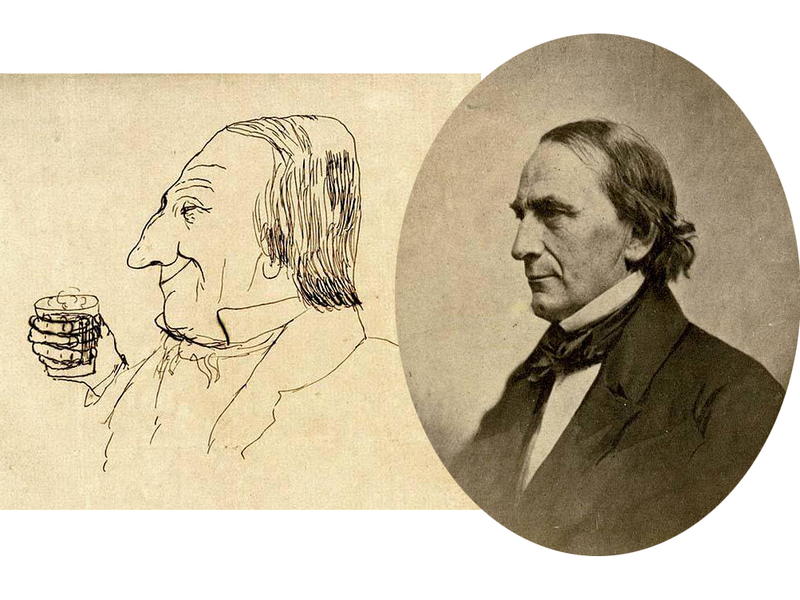 Mary Saunders, curator of the Harvard Club of New York, has sent Primus this dispatch: “For many years in the old bar of the club hung a framed set of two small pen and ink doodles of a jolly man drinking. One of them appears below. It was signed with an ambiguous monogram, but not dated or labeled in any way. It seemed of some importance as it appears displayed prominently on the fireplace mantel in an 1895 photograph of the club’s entrance hall. A new bar that opened in 2003 had much less wall space, and the doodles were relocated to one of the bedroom hallways, where they have hung for the past 14 years. They joined the list of items called Mysteries of the Collection. The living who haunt Mount Auburn Cemetery in Cambridge and Watertown, Massachusetts, do so for a host of reasons. The cemetery is at once a lovely place for a stroll, a wildlife sanctuary full of birdwatchers and frog lovers, a trove of superb trees and shrubs usefully labeled, and the resting place of many interesting people. To the list we add “museum.” The Friends of Mount Auburn has recently published an informative, pleasant, and elegantly produced publication, The Art of Commemoration and America’s First Rural Cemetery: Mount Auburn’s Significant Monument Collection. The authors are Melissa Banta, consulting curator at Mount Auburn and curator at Harvard’s Weissman Preservation Center, and Meg L. Winslow, curator of historical collections at the cemetery. Of the more than 60,000 memorials on the grounds, they focus on 30 of special artistic and historical significance.